The question of rather or not we actually needed our range hood came up when my fianceé and I were cleaning the kitchen. We were wiping off greasy film that had built up on the underside of the hood (Not a fun job might I add). As if some psychic connection existed, we simultaneously asked each other if we had ever used the hood. The answer was no. The house was built a few years ago and has an open kitchen design, ventilation comes naturally with high ceilings. The lighting on the kitchen ceiling is more than ample to illuminate the range. So the question remained, do we need a range hood? Turns out, you really don’t need it at all. They aren’t required by any building code and are really a matter of preference, ventilation and lighting. If we removed ours, we would have more room above the range for better access while cooking, a more open look and hopefully, easier cleaning! This would also give us the option of adding an additional storage cabinet above where the hood is now; allowing for a little more storage space for the less used kitchen items. The pros of getting rid of the range hood started outweighing the cons of keeping it at all. There are some cons however that needed to be considered. We would have an unfinished wall if we removed the range hood and that would have to be dealt with. As well as the hole in the wall where the hood exhausts to the outside of the house. However, this opened up the possibility of adding that subway tile back splash that we really wanted! The tile back splash would be relatively easy to clean should grime build up and has a really neat look that we like. Additionally, we would never have to worry about the cost of replacing the range hood filter. One last push to finalize our decision was our desire for energy efficiency in the kitchen. This would be a good start, with one less fixture plugged into an outlet. Find your circuit breaker and turn off the power going to your range hood. We couldn’t figure out which one did this because they weren’t marked. We turned the fan on the hood and flipped the switches until we found the right one. Then we removed the filter under the hood and unscrewed the panel. It was at this point that I realized there was electrical wires that needed to be dealt with. I disconnected them and put the wire nuts back on the wires. We ended up terminating the wires and hiding them behind the new cabinet. Lastly you have to unscrew the fixture from the wall. As soon as the last screw was removed, the hood came out easily. Removing the range hood did take a little work and planning, but was well worth it! We are very happy with our new look in our kitchen and the extra space. 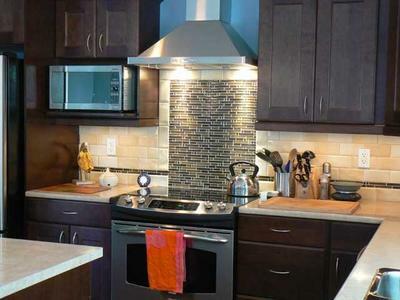 If you are thinking about removing your range hood, make sure that you will have proper ventilation without it. It worked out great for us, but not everyone should remove their range hood. My biggest advice is to do your research before you get started. Cook with the range hood turned off to see if you can live without it.